The U.S. Navy plans to resume deployment of its Littoral Combat Ships this fall following a delay in 2018 due to challenges in manning and advanced training, USNI News reported Monday. Vice Adm. Richard Brown, commander of Naval Surface Forces, said the service branch intends to return three LCS before fiscal year 2019 ends in September. USS Montgomery and USS Gabrielle Giffords would deploy from San Diego to the Western Pacific, while the third ship USS Detroit would go to the East Coast from Florida, according to the official. “We are very excited about that because the naval component commanders are screaming for LCSs because they know what they’re going to bring to the fight,” Brown said. He noted the ships would only focus on anti-surface warfare missions, including partner-building exercises, fisheries patrols and other activities supporting a small surface combatant. 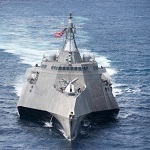 The Navy plans to deploy another LCS by early 2020. The Naval Surface Force Pacific released a report in August showing the service was facing challenges in assigning crews to operate and support the ships and that those sailors appeared not fully training for the 2019 deployments. The Navy has yet to announce plans to address the issues.